The innate immune system is an evolutionarily conserved system acting as a first-line of defense against invading microbial pathogens and other potential threats to the host. A range of pattern recognition receptors (PRRs) recognize specific pathogen-associated molecular patterns (PAMPs) exclusively present on microbes such as viruses, bacteria, parasites and fungi. In addition, PRRs are involved in sensing endogenous ‘danger’ signals by recognizing danger-associated molecular patterns (DAMPs). The recognition of PAMPs or DAMPs by the PRRs triggers an inflammatory response. Innate inflammatory responses include the secretion of cytokines/chemokines, the induction of antimicrobial peptides, pyroptotic cell death and the recruitment of phagocytic cells. Exquisite coordination of the multiple innate immune pathways is crucial to the efficient destruction and clearance of invading pathogens and other molecular threats. Importantly, the innate immune system not only precedes but empowers the highly specialized adaptive immune system to confer long-lasting immunological memory. 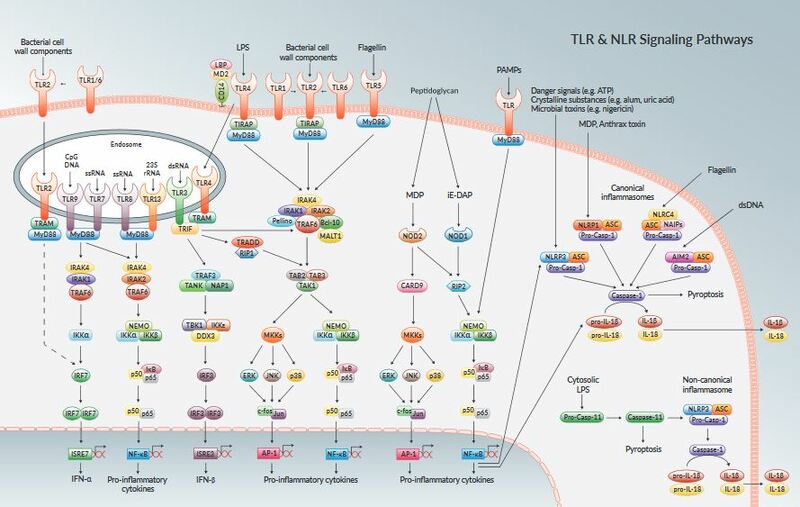 The main PRRs families of the innate immune system are the Toll-Like receptors (TLRs), the NOD-Like receptors (NLRs), the RIG-I-Like receptors (RLRs), cytosolic DNA sensors (CDS), the C-type lectin receptors (CLRs), and also playing central roles are inflammasomes and autophagy. TLRs are the first identified and the best characterized receptors among the signaling PRRs. Signaling by these receptors initiate key inflammatory responses and also shape adaptive immunity. All TLRs (10 in humans and 11 in mice) are type I transmembrane proteins characterized by an extracellular leucine-rich domain and a cytoplasmic tail that contains a conserved Toll/IL-1 receptor (TIR) domain. TLRs recognize a variety of PAMPs from bacteria, fungi, parasites, and viruses, including lipid-based bacterial cell wall components such as lipopolysaccharide (LPS) and lipopeptides, microbial protein components such as flagellin, and nucleic acids such as single-stranded or double-stranded RNA and CpG DNA. TLR ligands include host endogenous DAMPs liberated from damaged tissues and cells. TLRs initiate shared and distinct signaling pathways by recruiting different combinations of four TIR-domain-containing adaptor molecules: MyD88, TIRAP (Mal), TRIF and TRAM. 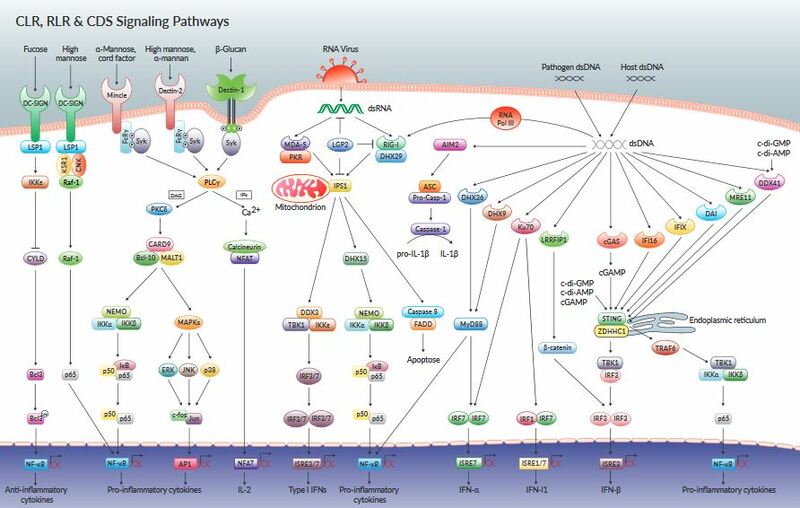 These signaling pathways activate the transcription factors NF-κB and AP-1 leading to the production of inflammatory cytokines and chemokines. They also activate interferon regulatory factors leading to the production of type I interferons. NLRs constitute a family of intracellular pattern recognition receptors (PRRs), which contains more than 20 members in mammals. Although the ligands and functions of many of these receptors are not known, their primary role is to recognize cytoplasmic pathogen-associated molecular patterns (PAMPs) and/or endogenous danger signals, inducing immune responses. NLRs are characterized by a tripartite-domain organization with a conserved nucleotide binding oligomerization domain (NACHT/NOD), leucine-rich repeats (LRRs) involved in microbial sensing and an N-terminal effector region comprising a protein-protein interaction domain such as the CARD, pyrin or BIR domain. A standardization in nomenclature of NLRs is based on the effector domain, and gives rise to 5 subfamilies; NLRA, NLRB, NLRC, NLRP and NLRX. NLRCs include NODs and NLRC4 (or IPAF) and contain CARD effector domains, whereas NLRPs (or NALPs) contain pyrin effector domains and NLRBs are the NAIPs containing BIR domains. RLRs constitute a family of cytoplasmic RNA helicases that are critical for host antiviral responses. The RLRs include the RNA sensors RIG-I, MDA-5 and LGP2, which when activated lead to the activation of transcription factors that also control the transcription of genes encoding interferons and other cytokines. RIG-I and MDA-5 sense double-stranded RNA, a replication intermediate for RNA viruses, leading to production of type I interferons in infected cells. LGP2 contains a RNA binding domain and acts as a negative feedback regulator of RIG-I and MDA-5. Recent advances in the recognition of nucleic acids have identified a family of cytosolic DNA sensors. Among some of the known DNA sensors are DAI, LRRFIP1, AIM2, IFI16 and the negative regulator p202. Cytosolic DNA sensors detect exogenous double stranded DNA leading to the induction of interferons and/or the processing of pro-inflammatory cytokines. CLRs, also called the C-type lectins, encompass a large family of proteins that act as phagocytic receptors that bind carbohydrate moieties of various pathogens. The significance of the CLRs in shaping the adaptive immune response is becoming apparent. The lectin activity of these receptors is mediated by conserved carbohydrate-recognition domains (CRDs). These receptors are involved in fungal recognition and the modulation of the innate immune response for the clearance of microbes and antigen presentation to T lymphocytes. CLRs include Dectin-1, Dectin-2, Mincle, DC-SIGN, DNGR-1 and the soluble MBL. Inflammasomes are multiproteins caspase-1-activating complexes assembled by cer tain NLRs. Caspase-1 is activated by inflammasomes through autoproteolytic maturation, leading to the processing and secretion of the pro-inflammatory cytokines. and the AIM2 containing inflammasome. danger signals and potentially dangerous cytoplasmic DNA. Autophagy pathways function to eliminate unwanted constituents from the cells such as intracellular pathogens, damaged organelles and long-lived, aggregate-prone proteins, and to recycle cytoplasmic material to maintain cellular homeostasis. Autophagy has been shown to interact with PRRs, such as the TLRs, NLRs and RLRs to regulate inflammation. Recent advances indicate an essential role of autophagy in innate and adaptive immune responses.